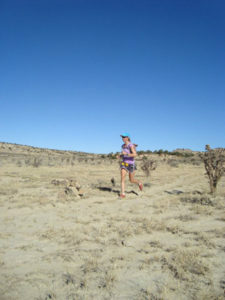 This seasoned trail and ultra runner has a confession to make: I used to love road marathons. My first one was the Rock’n Roll San Diego, in 2001. 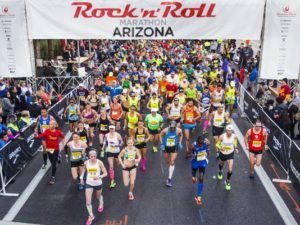 I was 30 years old and admit to feeling excited about running 26.2 paved miles in the company of 20 000 or so like-minded people while loud live music blasted all along the course. 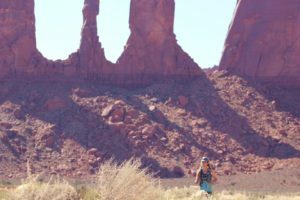 My love for trail ultras started ten years later, as a midlife crisis affair, a classic case of the grass looking greener on the other side of the asphalt. But what began as a casual flirtation developed into a serious relationship. The trails loved me back. I broke up with road marathons, except for very occasional weekend flings. I had one of those recently. A month ago, right before running the Cedro Peak 45 miler, I watched the finish of the 2016 Boston marathon. It was the equivalent of stalking an old flame on facebook and discovering he still looks hot. Overcome by a mixture of nostalgia and severe FOMO, I signed up for the next road marathon within driving distance in the hope of qualifying for Boston. Never mind that I had not done any speed work in years. Never mind that I only had two weeks to recover from the ultra, train for the road marathon, and then taper. But while struggling to add some half-hearted tempo miles to my daily workouts, I had time to think about the differences between the two types of races. It’s important, I think, to point these out to prospective long-distance runners, so they can make informed decisions about who they really want to be with. Even before meeting a race in person, websites and online advertising gives us a first clue about what to expect. Like the guy on a dating website who sounds just a little too perfect to be real, road marathons minimize any mention of possible discomfort runners might –no, will — experience. They like to bill themselves as flat, fast, and fun. They like to boast about tons of adoring fans all along the course, about water stations every 500 feet, about cheerleading teams, bands, and the like. During Big Sur, a guy in a tuxedo plays a grand piano on top of a hill, against the backdrop of the pacific ocean. A magnificent and welcome sight, forever etched in my memory. 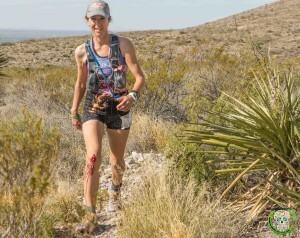 Trail ultras take the opposite approach: they emphasize how rugged and rock-infested the course is, how many tens of thousands of feet runners will climb, how only the toughest runners have a chance at reaching the finish line alive, and how even those won’t reach it unscathed. Race directors proudly announce things like “You will bleed. You will puke. 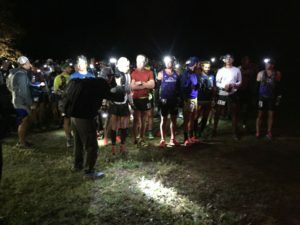 You will suffer.” The Bandera 100k charmingly defines itself as “a race where everything cuts, bites, or stings.” One particularly sadistic RD who shall remain nameless sends his runners, once registered, a condolence letter. 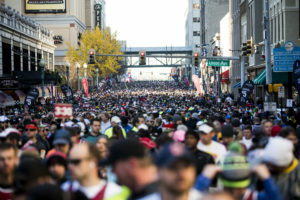 At the race start, road marathons involve thousands of people crammed into corrals, where runners clothed in sleek, aerodynamic outfits are grouped together according to their projected finishing time. Near the front, superhuman athletes with zero percent body fat pace and prance like thoroughbred horses before the Kentucky derby. Further back, runners of all shapes and sizes wait patiently, conserving energy. They will spend a lot of time after the race has officially started walking or shuffling toward the starting line. Once there, everyone tries to pass as many other runners as possible in the first mile, even though there are 25 miles left to go. In trail ultras, the crowd of a few dozen to a couple of hundred bearded, scruffy individuals puts on their buffs and hydration packs and multiple layers of clothing, then gathers into a shapeless clump. But the scruffy individuals with just one handheld bottle and zero percent body fat still gravitate toward the front, while the hydration-pack wearers of all shapes and sizes hang back a little. Unless, of course, no one is sure where the front is because no one is sure about which general direction the race goes in until the RD points it out with a casual “Ok, go have fun today.” Then, everyone takes off way too fast, trying to pass as many people as possible even though there are 30, 49, or 100-plus miles left to go. One of the most glaring differences between the two involves the frequency and setup of aid stations. In a road marathon, aid stations appear at regular intervals, like clockwork, every mile or every two miles. 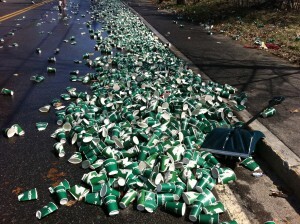 Bright-eyed children offer water or gatorade from paper cups, which runners grab, empty, and then toss on the ground until it looks like the area around the card table has been hit by a small snow storm. No one actually stops. 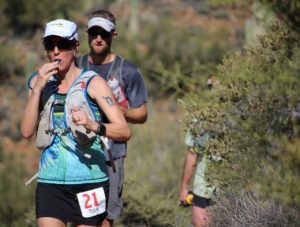 In a trail ultra, there are aid stations every five to ten miles (except for the final ten miles of Western States, which is basically one long buffet line). 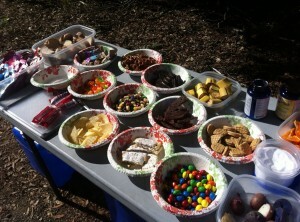 Usually, especially late in a 100-miler, runners fantasize about the next aid station long before actually getting there. I have burst in tears at the sight of an aid station. It’s like an oasis in the desert, like a taste of the finish line. It’s a huge accomplishment to reach an aid station, especially when, fifteen minutes earlier, you were sure you would collapse in a heap on the trail and get eaten by a mountain lion. Chairs beckon. Campfires blaze. Food selections range from cookies and fruit to turkey sandwiches or even more elaborate offerings. Sometimes, the smell of soup and bacon wafts through the tent. Friendly people you have never met before bring your drop bag, peel off your smelly socks and doctor your blisters. Aid stations are places of celebration and gratitude. It’s tempting to spend way too much time there getting fed and pampered. That’s why it’s important to have a plan that involves getting back out on the trail ASAP. Crossing the finish line of any race is a celebration, whether its in a giant stadium or a camp site in the middle of nowhere. Nothing compares to the glowing, fuzzy feeling that mixes with the pain in your quads as you finally stop moving.There is food, there is camaraderie, there is music. Usually, there are pain-relieving drink options. Maybe there’s more beer flowing at the finish of trail ultras, but I can’t be sure — volunteers for a scientific comparative study of post-race alcohol consumption, please send me an email. There is, however, one important difference: after a road marathon, my white socks are still white, and my legs are pretty much the shade of tan they were when I started. The post-race shower feels great, but the water swirling down the drain is mostly clear. After a trail ultra, that water is mixed with dirt, sand, and often blood. I have worried about clogging the pipes of the Payson Best Western after Zane Grey, where thorny vegetation tears up runners along the course until they look like torture victims. My trail socks, whether or not they once were white, have turned into shades of grey, brown, or orange, depending on the color of dirt I just ran through. Today is Monday, 48 hours after my marathon. I am still sore. Road marathons hurt as much or more the day after the race than trail ultras that are twice as long. I think that’s because walk breaks tend to be frowned upon during a flattish 26.2 on pavement. 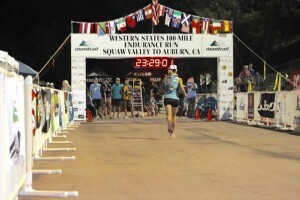 Come to think of it, the differences between trail ultras and road marathons are not as serious as I thought. 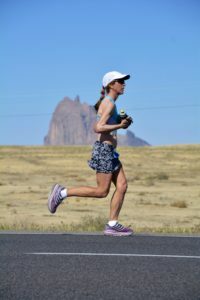 And some races are crossovers, combining the best of both worlds, like my marathon in Shiprock, New Mexico, on a beautiful stretch of desert highway. 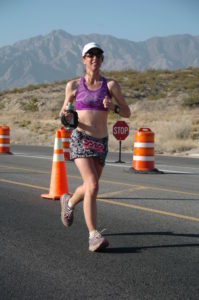 200 runners quickly spread out along the course, and I ran 26.2 blissful miles mostly alone, to a 3:26 PR finish. I qualified for Boston, and might actually run it, but in the meantime, I am going back to my marriage with the trail ultras. I’m sure the trails will understand that my commitment stops short of complete monogamy. It is a good time to be alive and running, anywhere. This entry was posted in Uncategorized on May 9, 2016 by silvakat. Thanks, Ulises! Would you describe yourself as trail monogamous? Dan, you are a legend. You are in a category of your own. No one would ever describe you as scruffy. Well written & a fun read Katrin! Loved reading this and just kept snickering. Oh so true. I have contemplated kissing the ground when reaching an aid station. I am always so pathetically grateful . Britta, its not pathetic to kiss the ground. It’s normal! I have almost done it, just was too sore to bend low enough. MaryAnn, the nightmare thesis is 97 pages long and almost done. I can see the finish line of the thesis ultra — will revise over the summer, defend in September, and BAM! Done. I look forward to writing more pieces that people actually enjoy reading. Think how light you will feel and with that weight off. How more quickly you will run. Fun stuff — I have made enough mistakes to relate to most of it. Thank you for writing. The mistakes make everything more interesting, including blog posts. Glad you liked it! I loved this post, a very fun read and totally agree!! 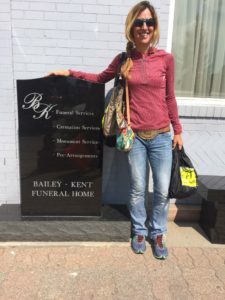 I just finished my road marathon for the year (also BQ’d) and am also heading back to the trails/ultras (though not nearly as fun/glamorous as the USA races). Happy running. Gosh, I’m so promiscuous. Road marathons, 5Ks, fun runs, trail races, trail ultras, track workouts, I love them all. Except treadmills. I just love running. No, that was a lie. I do treadmills, too. Me, too (except for the track). Monogamy just isn’t working out. Love this! Can I have your permission to post a link? And I will certainly give proper credit. (By the way, I am the Marketing Director for a Dallas-area race production company called The Active Joe. We produce both road & trail races, & trying to encourage people to appreciate both – this does that quite well). Awesome comparison and I will definitely be sticking with the awesomeness of trail and ultras, on trails! Hey Adam, thanks for reading and relating. Yes, there is nothing more emotional than seeing the lights of an aid station in the distance, except for seeing the finish line.